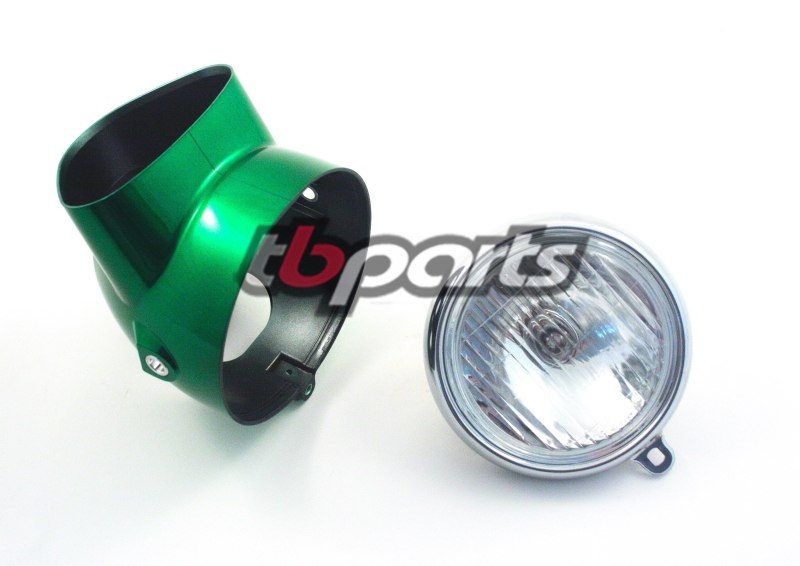 Save $2.25 by purchasing both the headlight assembly and the bucket in this listing. This is a perfect reproduction of the CT70 HK0 Candy Emerald Green headlight bucket and is virtually indistinguishable from the original. Unlike others available, these do not need any dremel work to make the Honda OEM headlight fit. Additionally, the bucket includes the metal spacers in the mounting holes just like the original did. They help prevent cracking when the mounting bolts are tightened. Often the original buckets have cracked over time or are missing when you purchase a CT70, so here is the solution to those problems at a great price! The same buckets were also used on some other older Honda models like the SL90, CL90, CL70, & S90. However, Honda used different colors on them. Note: Any marks/spots in the picture are just from the camera flash. This headlight is virtually identical to the OEM version. The only notable difference is that it does not have the beam adjusting screw. No modifications are needed – just plug in and ready for the night!